Free Webinars - Join Elfie's Birthday project: Hope and Reasons for Living - A free mini online course with Heather Fiske, Brigitte Lavoie and Elfie Czerny on Solution Focused Suicide Prevention. 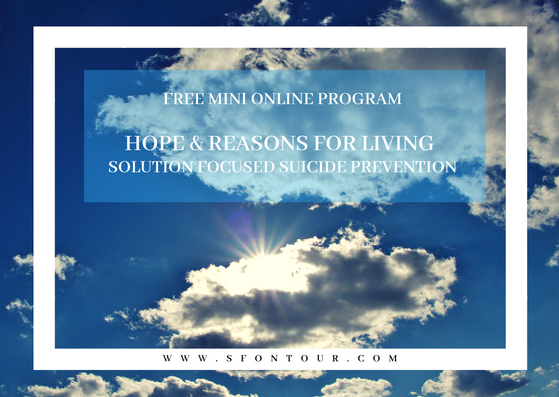 Join Elfie’s birthday project and be part of this free mini online course “Hopes and Reasons for Living – Solution Focused Suicide Prevention”. More than 200 people have already joined in, be one of them! other resources connected to the topic. how Solution Focus conversation can highlight and reinforce hope and reasons for living. Heather Fiske has over 45 years of clinical experience and is the author of the book “Hope in Action: Solution Focused Conversations about Suicide”. Currently she is in private pracitise and is active in clinical consultation, supervision and education. Heather has served as a Director of the Canadian Association of Suicide Prevention (CASP) and is one of the founders of the Solution Focused Brief Therapy Association (SFBTA). Heather was a guest on our Simply Focus Podcast #27. Brigitte Lavoie has been a psychologist for more than 25 years. She has taken, developed, and given training in brief therapy and crisis intervention for more than 20 years. She was Managing Director and Clinical Advisor at Suicide Action Montreal. Brigitte has devoted her career to contributing to the improvement of mental health services. She is known for her passion for storytelling, her respect for clients, and her determination to improve services while protecting the wellbeing of mental health professionals as well as their clients. Brigitte has was a guest on our Simply Focus Podcast #25. I am in love with the adventure of finding ways to invite joy into my life. As I learned over the years, joy for me has a lot to do with feeling connected. Feeling connected with the beauty around me, feeling connected with someone I love, someone I appreciate, feeling connected with my body, as the gift that allows me to express myself in this life, feeling connected with nature, love, and with my possibilities. Joy for me is about honoring this life, in this moment, now – it’s about feeling connected with my reasons for living. One of the things that make me so passionate about Solution Focus is the way we invite people to meaningful conversations and how by that we co-create connection. Solution Focus for me is a lot about creating connection, it’s about interaction, it’s about co-creating a preferred future that shows what is possible for each and everyone of us, it’s about inspiring others to go for their dreams and preferred future and it’s about encouraging others to fully live THIS life! Last summer a beautiful human died by suicide, someone who meant so much to me, who inspired me, someone I truly loved. From the bottom of my heart I wish could have infected this awesome human being with the joy I feel so present in my life. This summer, as a birthday present to myself and the world, I want to do something meaningful in honour of this beloved person. This is how the idea of a conversation about hope and reasons for living came up. I reached out to two wonderful women who have worked in the field of Solution Focused Suicide Prevention for many, many years and asked them whether they would support me and share their experience around this topic. And they said YES! So just in time for my birthday, I’m super excited to invite you to this FREE online event with Heather Fiske, Brigitte Lavoie and myself about „Hope and Reasons for Living“.